*insert random sentence here* ello. then face it. you will get better in time. you cannot win all the way 24/7 . Thank god, the hype milking can finally come to a rest...after a few days of post-boxing milking. Ksi is obviously going to win. Waste of money. 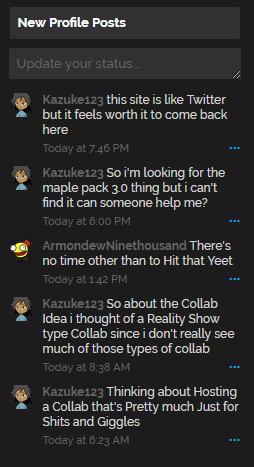 So i'm looking for the maple pack 3.0 thing but i can't find it can someone help me? A Reality Show? What sort of reality show are you thinking of? Like a Game Show? A Survival Show? Feels like the My Movie collabs kinda fit that criteria, only they're separate scenes instead of a constant storyline. Dally and Falln like this. A good time to unrust! pretty much? But it is to see if someone is active. Also how's your day Guys?